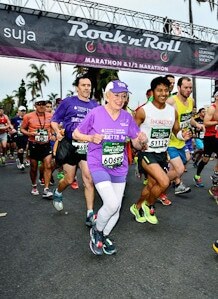 Today, 91-year old marathoner Harriette Thompson completed the San Diego marathon with a record-breaking time. In honor of this very special woman, I’ve decided to dedicate this podcast episode to her and share five things, among many, that I believe she can teach us about running. Harriette Thompson is a cancer survivor. She was recently treated for squamous cell carcinoma on her legs. In fact, she trained for the marathon while having to deal with radiation treatment. I’ll tell you from personal experience that training for a marathon is not easy. It is very difficult. But it’s not something to be feared either. I believe that just about anyone can train for a marathon if they only have the self confidence to try, a good running base, and the willpower to train. Harriette is a prime example of what running goals you can achieve if you simply try. 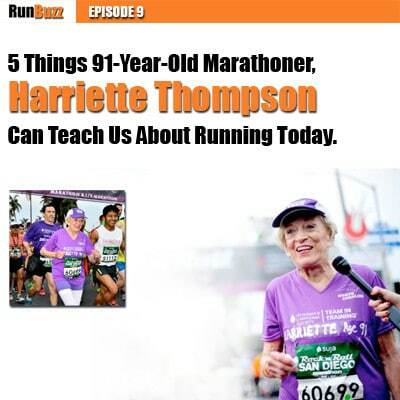 Harriette didn’t run her first marathon until she was 76 years old. She’s run a marathon every year since. I ran my first marathon at 38 which, by my kids’ standards, made me somewhere between the Jurassic era and a few centuries before BC turned to AD. While age may sometimes present more obstacles, that doesn’t mean you can’t achieve your running goals. And it’s never too late to start trying. Yeah, you probably already knew that, but how about this – did you know that runners raise millions of dollars each year for charity? In fact, since age 76, Harriet has run annually on behalf of the The Leukemia & Lymphoma Society and Team In Training, and generated more than $90,000 dollars alone! So whether it’s directly through fundraising or by participating in events where the entry fee benefits a charity, runners generate an amazing amount of money every year for great causes. Harriett’s $90,000 dollars may not have been raised at all if she hadn’t seen the opportunity to put her running towards something good. In the Runners World Article I read, Harriet stated that she didn’t have the opportunity to train as well as she wanted to because of the radiation treatments. She also explained that she was pretty tired at mile 17. Whether she hit the wall or not, running 9 more miles after you start to feel the drain is no simple feat and is something that can inspire all of us runners. Running should be fun. It should be something you enjoy, not dread. In every photo of Harriet I’ve seen, she’s always smiling. Ultimately, running needs to be something you enjoy so you’ll continue doing it.